Has your blender made its way to the back of the cupboard because the idea of making a smoothie in this chilly Winter puts you off ? Dust the handy appliance off ASAP. Here are 5 fantastic uses for your trusty blender. Place all of the ingredients into a blender and blend until combined. If not fully blended, scrape down the sides and blend again. Season to taste. Place all of the ingredients into a blender and blend to make a paste. If not fully blended, scrape down the sides and blend again. Place the pine nuts, basil, garlic and parmesan in a blender and process until finely chopped. With the motor running, gradually add the oil in a thin steady stream until well combined. Place the halved tomatoes, quartered onions, and garlic cloves into a large bowl and add the oil. Season well with salt and pepper, and stir well to coat. Pour the oiled and seasoned vegetables onto a baking tray, and roast at 180C for about 30 minutes. Set the roasted vegetables aside for 15 minutes to cool and then place the veggies into your blender. Once the soup is blended, add the yoghurt/coconut cream and, salt and pepper to taste. 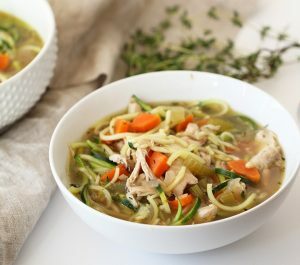 If you are serving the soup immediately – pour the soup into a pot and heat on the stove top for 5 minutes. Place parsley, basil, garlic and capers in a blender. Process until finely chopped. With the motor running, add oil and 2 tablespoons lemon juice to parsley mixture. Blend until well combined. Season with sea salt and pepper. Blenders are so versatile. From the above mentioned recipes to the humble pancake, frothy lattes or simply grinding flaxseeds – there should be no reason to ever push your blender to the back of your cupboard. Temperatures are dropping, and there is something so comforting about sipping on a warm bowl of goodness. 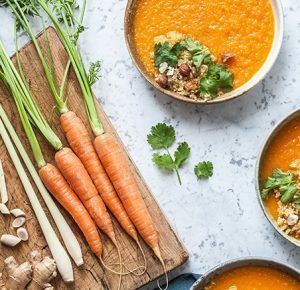 Avoid the pre-made stuff and use up all those leftover veggies in the fridge by whipping up these quick and super easy, heart-warming soups. These recipes are rich in anti-oxidants and plenty of other nutritious, delicious superfoods. The best part is, they can be made in 60 minutes or less. Start out with preparing the ingredients. Peel and dice the sweet potatoes and the butternut. Wash and chop the kale, onion, and apples. Bring the coconut and almond milk to a boil in a large saucepan. Add the sweet potato and butternut and cook on medium heat for about 10 minutes or until the sweet potato/butternut is soft. Add the kale, onion, and apples to the saucepan. Season with salt, pepper, and optionally curry according to taste. Let simmer for another 10 minutes. In the meantime, roast the pine nuts in a frying pan. 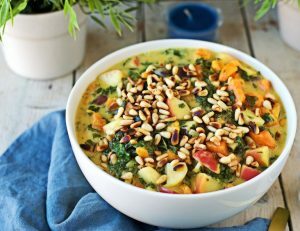 Serve the soup hot with a good amount of the roasted pine nuts and fresh coriander. Toss the carrots and beets with 1 tablespoon of the olive oil. Spread out onto a baking sheet, transfer to the oven and roast for 30-40 minutes, or until the veggies are tender when pierced with a fork. Place the remaining tablespoon of olive oil into a large saucepan over medium-high heat. Add the onion to the pan and sauté for about 2-3 minutes, or until the onion begins to become soft. Add the garlic and ginger and sauté for one minute more, or until the garlic/ginger becomes fragrant. Add the roasted beets, carrots and vegetable stock to the saucepan. Bring to a boil, reduce heat to medium-low and simmer for about 20 minutes, or until lightly thickened. Stir in the vinegar, cayenne pepper and turmeric. Season with salt and pepper to taste. Transfer the beet stock mixture to a blender or blend in the pot using a blender stick. Blend until smooth. Serve with chopped coriander to garnish. Place a large soup pot over medium heat and add in the onions, celery, carrots, garlic and red pepper flakes. Cook for 3-5 minutes or until vegetables “sweat” and onions are translucent. Add in the thyme and oregano and cook for another 1 minute, stirring frequently. Place in the chicken thighs and bay leaf and pour in the chicken broth and water. Cover and let the mixture come to a boil. Once boiling, lower to a steady simmer and cook for 30 minutes. After 30 minutes, remove the chicken and peel off the skin and discard. Then, shred the chicken off the bone and set aside, with any juices. Place the bones back into the soup pot and simmer for 10 more minutes, uncovered. While the bones simmer, slice the zucchinis halfway lengthwise. Then, spiralize/grate the zucchini. Set aside. Remove the bones and bay leaves and discard. Add the reserved shredded chicken back to the pot along with the zucchini noodles. Cook for 5 minutes or until zucchini is al dente. Season to taste. Start by peeling the ginger, then chop it finely and crush the garlic cloves. Add these to a large frying pan with a drizzle of olive oil, salt and pepper. Let this heat up and sauté for a few minutes before adding in the tamari, finely chopped celery, frozen spinach and broccoli. Stir this around for a minute before adding the water and frozen peas to the pan. Add a generous pinch of salt and let this heat up for about 15 minutes, stirring occasionally. Once everything has cooked pour the mixture into your blender with the lemon juice, chilli flakes, miso paste and almond milk. Blend it all together until it’s really smooth and creamy!